The Collective Security Treaty Organization Secretary-General believes member states need to guard against infiltration attempts from Afghanistan and a growing drug menace. The NATO coalition mission has failed in Afghanistan, as the international forces gave priority only to military tasks, Secretary-General of the Collective Security Treaty Organization (CSTO), a Eurasian security bloc, Nikolai Bordyuzha, told Itar-Tass in an interview. “The main reason is that the US and NATO had resolved only military tasks in military way, moreover, carelessly,” Bordyuzha said. “Many countries positively assessed the decision to bring military contingents in the country and the opinion about their actions has changed in Afghanistan and the whole world,” the CSTO chief added. “Why? Because one cannot kill hundreds, even thousands of civilians. Journalists, children cannot be hit. Women cannot be killed, drones cannot shoot at weddings...,” he noted. Bordyuzha said, that the CSTO is expecting infiltration attempts by Afghan armed gangs across member-states' borders, but ruled out a large-scale invasion. “But I'm confident that we'll see infiltrative attempts which already happen,” he added. According to the CSTO secretary general, the number of clashes on the Tajik-Afghan border has increased by several fold in the past six months. “These are attempts by armed gangs to break through the state border of Tajikistan, they are drug mafia and armed groups engaging in other things, such as politics,” Bordyuzha said. CSTO is expecting attempts to ideologically influence the population of Central Asia countries and set up underground extremist groups in member-states which would be led by Afghan emissaries. “Drug business and drug trafficking are another threat. We're anticipating hard times, and we're getting ready for them,” Bordyuzha said. “There is no complete clarity yet but we know for sure that the USA will also keep its military bases there,” the CSTO chief said. Bordyuzha believes that the International Security Assistance Force (ISAF) in Afghanistan was not tasked with combating drug-trafficking in the country, in order not to create more problems for itself. While stating that the main task was to deal with armed Taliban groups, the NATO countries took an ostrich-like stance. “Meanwhile, the drug mafia was developing its production, perfecting their smuggling channels. At present, it has a rather ramified network which is difficult to fight,” Bordyuzha said. 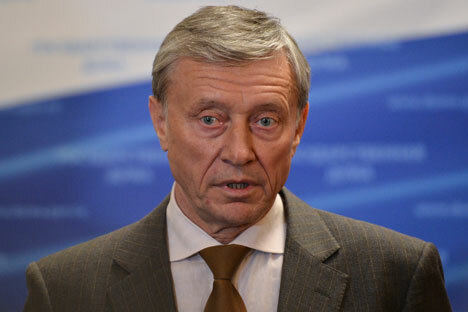 He underlined that drug trafficking fight was priority for CSTO member-states. For example, the drug-smuggling routes are in the zone responsibility of CSTO special task forces. “In addition, the CSTO is setting up a centre for special anti-drug trafficking operations per decision approved by our presidents,” Bordyuzha said. Earlier, director of the Russian Institute for Strategic Studies Lt-Gen Leonid Reshetnikov said drug trafficking had increased by 40 times during NATO presence in Afghanistan and that a considerable portion of narcotics was smuggled through Russia.